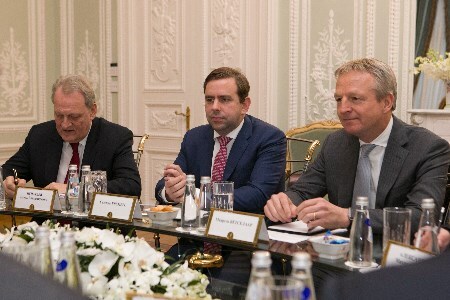 A working meeting between Alexey Miller, Chairman of the Gazprom Management Committee, and Maarten Wetselaar, Member of the Executive Committee of Royal Dutch Shell, took place in St. Petersburg on 20 November. The meeting addressed relevant aspects of strategic co-operation. Particular attention was paid to joint efforts in the liquefied natural gas (LNG) sector. The parties discussed the construction project for the third train of the LNG plant on Sakhalin Island and the progress of the Joint Study Framework Agreement for the Baltic LNG project. The meeting also focused on the Nord Stream 2 pipeline project. Nord Stream 2 is the construction project for a gas pipeline with the annual capacity of 55 billion m3 from Russia to Germany across the Baltic Sea.